In Q1 2017, the U.S. market installed 2,044 MWdc of solar PV, a 2% decline year-over-year. In Q1, solar ranked as the No. 2 source of new electric generating capacity additions brought on-line, totaling 30%. Community solar continues to be a bright spot for non-residential PV with deployments in Minnesota, helping the segment grow nearly 30% over Q1 2016. GTM Research forecasts that 12.6 GWdc of new PV installations will come on-line in 2017, down 16% from a record-breaking 2016. 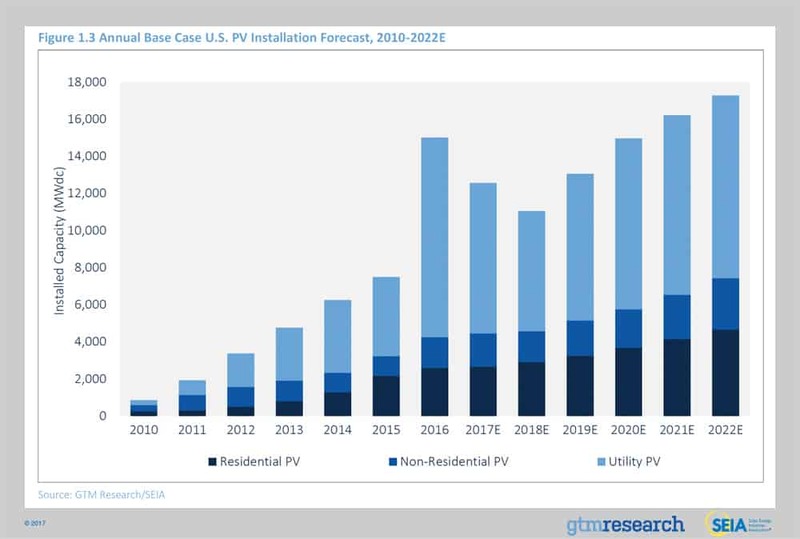 Total installed U.S. solar PV capacity is expected to nearly triple over the next five years. By 2022, over 17 GW of solar PV capacity will be installed annually. Suniva’s filing of a Section 201 petition to impose trade remedies on foreign-manufactured cells and modules threatens to significantly reduce PV installations across all segments if accepted in its current form. The nuances of this case are detailed in the Introduction below and will be further outlined in a forthcoming research note from GTM Research. In Q1 2017, the U.S. solar market installed 2,044 megawatts direct current (MWdc), following an unprecedented year of more than 15 GWdc installed in 2016. As was the case in 2016, Q1 2017 saw more than half of capacity additions come from the utility PV segment, which added more than 1 GWdc for the sixth consecutive quarter. When accounting for all projects (both distributed and centralized), solar continues to drive a growing portion of new electric generating capacity additions. Last year, solar ranked as the No. 1 source of new capacity additions, largely due to the double-digit-gigawatt wave of utility PV installations that came on-line amidst prior uncertainty over the extension of the 30% federal Investment Tax Credit. 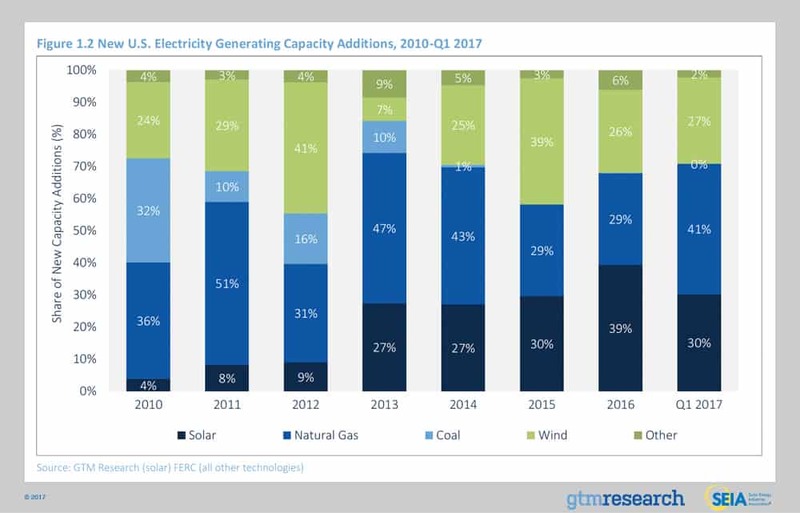 Building off that momentum, solar accounted for 30% of all new electric generating capacity installed in the U.S. in Q1 2017, ranking as the second-largest driver of capacity additions across all fuel types. In 2017, distributed solar is on track for a slowdown in growth across both residential and non-residential PV. In the residential PV segment, national residential solar companies continue to slow operations and pursue profitable sales channels at the expense of growth. Equally important, segment-wide customer acquisition challenges are constraining growth in major state markets, with California expected to fall year-over-year for the first time this decade. Meanwhile, factors including revisions to community solar programs rules, virtual net energy metering, and solar-friendly rate structures spurred a flurry of project development for non-residential PV in the second half of 2016. As we move further into 2017, a waning pipeline of projects still being grandfathered in under these programs, rates and incentives is expected to support incremental growth in 2017 for the non-residential PV segment. Finally, the majority of utility solar installations slated for 2017 remain driven by projects that pushed out their completion dates from 2016 as a result of the federal ITC extension. 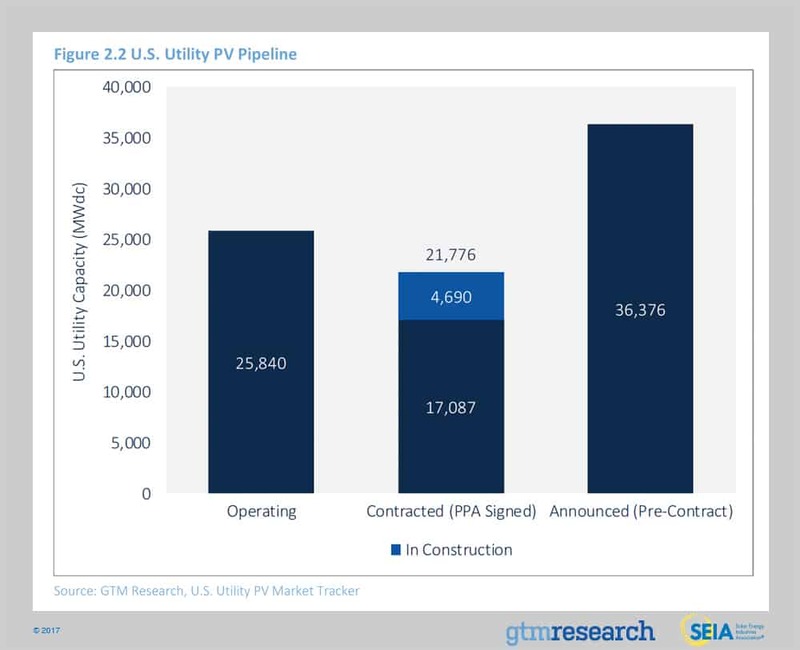 Utility solar is on the cusp of another boom in procurement, with the majority of utility solicitations focused on maximizing the number of projects that can come on-line with a 30% federal ITC in 2019 or later by leveraging commence-construction rules. But heading into 2018, uncertainty looms over the long-term outlook for U.S. solar, due to a new trade dispute initiated by the domestic module and cell manufacturer Suniva. On May 23, 2017, the International Trade Commission announced that it would consider Suniva’s, petition under Section 201 of the Trade Act of 1974. This petition could result in “remedies to safeguard against foreign-manufactured crystalline silicon photovoltaic products”, including import tariffs, volume limitations, or other measures. The ITC will make a determination of injury by Sept. 22, 2017, and if it finds injury (or threat of injury), it will recommend remedies by Nov. 13, 2017. President Trump could then accept, modify or choose not to implement ITC’s recommended relief measures. In its petition, Suniva is requesting relief against imports from all geographic sources. Suniva’s requests include, but are not limited to, a minimum price on crystalline silicon PV modules (initially $0.78/W) and a tariff on cells (initially $0.40/W). These requirements would step down annually for three additional years. The tariff on imported cells would step down to $0.37/W, $0.34/W and then $0.33/W, while the minimum module price would step down to $0.72/W, $0.69/W and then $0.68/W. For reference, a $0.78/W price on modules would match 2012 levels for imported Chinese modules and put average system costs at 2015 levels. In turn, while GTM Research expects 36 states to be at grid parity for rooftop solar at the end of 2017 under current conditions, 11 would fall out of grid parity if Suniva’s proposal were approved in H2 2017 and took effect next year. Meanwhile, more than two-thirds of the current utility PV pipeline stems from projects that utilities procured outside an RPS mandate, based on its cost-competitiveness with natural-gas alternatives. On top of that, more than 60% of the current pipeline comes from projects that signed PPAs in 2016 onward. Those 11 GWdc that support the near-term outlook are also at risk of project cancellation if module prices end up higher than developers’ assumptions when they initially originated contracts with utilities. With the above in mind, it remains to be seen how the International Trade Commission will ultimately rule on the Section 201 filing – an additional layer of uncertainty lies in how President Trump will respond to the ITC’s recommendations. 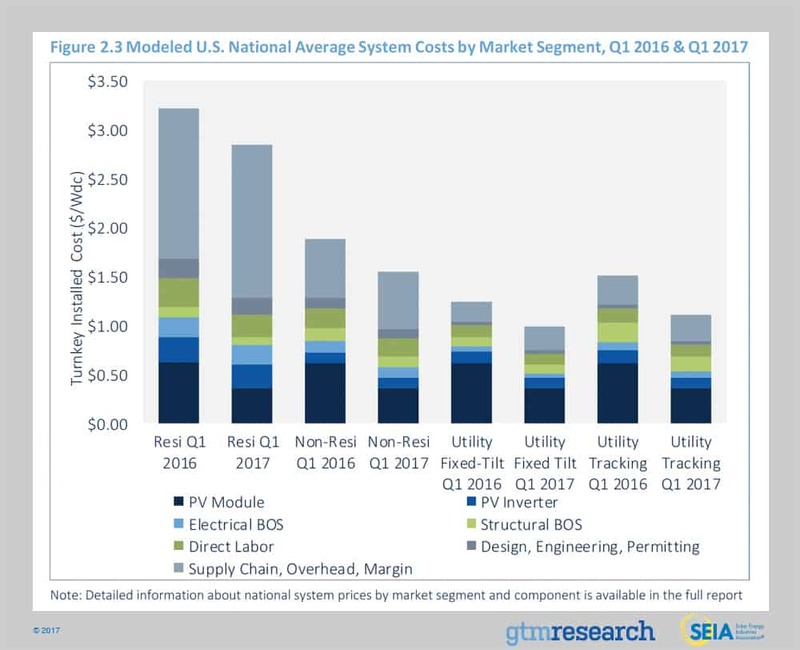 But if Suniva’s proposed minimum import price on modules and tariff on imported cells are approved, PV installations would significantly drop across all three market segments (further outlined in a forthcoming research note from GTM Research). For the first time since GTM Research has tracked the market, national installations fell on both a quarter-over-quarter and year-over-year basis. Much of this fall stems from California’s performance. California’s share of the market dropped to 35% in Q1 – its lowest quarterly share since GTM has collected this data. Though California’s reduced quarterly installation volume is in part due to an unseasonably rainy winter, the reduced presence of top national installers in unprofitable geographies is also partly to blame for this contraction. Additionally, an increasingly challenging customer acquisition landscape has played a part in California’s reduced installation volumes. Other major market geographies also continue to struggle with many of the aforementioned issues at a less severe scale. The Massachusetts, New York and Maryland markets all fell quarter-over-quarter, though New Jersey has shown resiliency among the major Northeast markets. Conversely, emerging state markets such as Utah, Texas and South Carolina continue to scale as national installers capture expiring incentives and tap into early-adopter customers. That said, continued emerging market growth was not enough to offset weakness across major state markets. Coming off the largest quarter for non-residential PV on record, the segment fell on a quarter-over-quarter basis despite posting over 30% growth year-over-year. While Q4 2016 regulatory demand pull-in led to record-breaking installation volume and growth in the nation’s two largest non-residential markets – California and Massachusetts – both markets fell quarter-over-quarter in Q1, though New York still managed to post a record-breaking quarter. That said, the once-dormant community solar pipeline continues to materialize, as Minnesota nearly doubled its cumulative community solar deployment in Q1 2017. 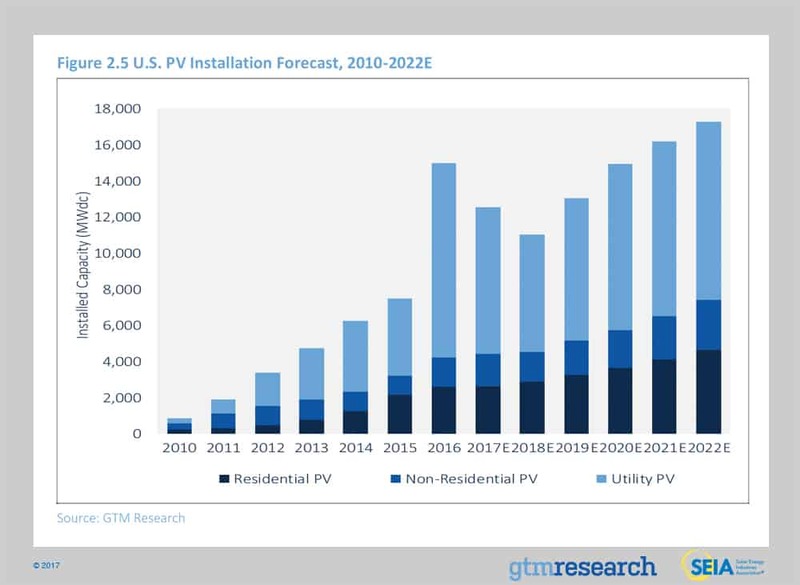 Utility PV continues to be the primary driver of installation growth in the U.S. solar market. A total of 1.1 GWdc of utility PV projects came on-line in Q1 2017, accounting for 53% of PV capacity installed. A total of 4.7 GWdc of projects are in construction, and Q2 is expected to see over 2.0 GWdc of projects come on-line. Consequently, 2017 will see an increase of 40% to 45% of annual installs in H1 in contrast to previous years in which H1 installations accounted for 30% to 35% of total annual installs. In the near term, GTM Research’s 2017 utility PV deployment outlook has declined. A total of 199 MWdc of projects that were thought to have spilled over into 2017 were later found to have come on-line in Q4 2016. Additionally, several hundred megawatts of PURPA projects in the Carolinas and Oregon have faced interconnection delays and are now expected to spill over into 2018. While our 2018 forecast increased only slightly, GTM Research’s 2019 forecast has risen by over 11% to 7.9 GWdc. This is due to several utilities announcing that they will procure additional projects for 2019, as well as developers looking to safe-harbor projects in 2019 to capture the full 30% ITC and offer the lowest possible PPA prices. PURPA continues to be the largest driver of utility PV, accounting for 43% of new projects in 2017. With several utilities petitioning state utility commissions to change the implementation of PURPA, GTM Research believes PURPA development will begin to wane in early 2018. Voluntary procurement will overtake PURPA as the largest driver, as utilities, particularly in the Southeast, continue to procure solar as a hedge against natural-gas prices. Underlying these geographic demand and procurement trends is the low-price environment for utility PV. Recent PPAs have been signed at prices between $35/MWh and $50/MWh. We utilize a bottom-up modeling methodology to track and report national average PV system pricing for the major market segments. Our bottom-up methodology is based on tracked wholesale pricing of major solar components and data collected from interviews with major installers. In Q1 2017, depending on the market segment, overall PV system pricing fell by as much as 6.2%. The segment with the largest price decline was the utility fixed-tilt sector. Total system pricing continues to trend downward across all market segments, much in the same manner it has since Q3 2015. Price declines of 6.2%, 5.9%, 4.0% and 1.7% occurred in the fixed-tilt utility, single-axis tracking, non-residential and residential sectors, respectively. This quarter continues a trend from Q2 2016 onward of a U.S. solar market impacted by tremendous change in system and component pricing. Again, primarily driven by the global module demand and supply imbalance, hardware markets produced aggressive component price declines in Q1 2017. Hardware costs fell by 6%, 7%, 10% and 9% in the residential, non-residential, fixed-tilt and single-axis tracker market segments, respectively. In Q1 2017, average pricing for residential rooftop systems landed at $2.84/Wdc – a 1.7% drop from Q4 2016’s $2.89/Wdc. This occurred even while national and regional installers continue to report little substantial success in cutting costs in the domains of operations and customer acquisition. In fact, customer acquisition costs have not changed in the past three quarters. As a result, soft costs stayed the same from Q4 2016 to Q1 2017. The non-residential sector saw a 4.0% fall in pricing this past quarter. In Q1 2017, flat-roof non-residential system pricing landed at $1.56/Wdc from Q4 2016’s $1.62/Wdc. Like the rest of the market, aggressive module, inverter and racking prices constituted almost all of this system pricing drop. Utility fixed-tilt and single-axis tracking projects in Q1 2017 saw average pricing of $0.99/Wdc and $1.08/Wdc, respectively. That represents a respective 6.2% and 5.9% price reduction from last quarter. The utility fixed-tilt 6.2% quarter-over-quarter drop was the largest of all other market segments in Q1. Price trends varied by component in Q1 2017, evidencing differences driven by component-level demand and inventory levels. For polysilicon, the quarterly average price increased 12% quarter-over-quarter to $16.78/kg in Q1 2017. Strong price growth was driven by healthy demand, low inventory levels, and suppliers’ push for higher prices. Wafer prices stayed flat quarter-over-quarter, remaining at $0.15/W. Soft demand and price pressure from buyers (cell and module producers) drove wafer price levels in Q1. Cell prices fell 7% quarter-over-quarter to $0.20/W in Q1 2017. The drivers affecting wafer prices also impacted cell prices. In addition, the ramp of new cell capacity put additional downward pressure on cell prices. In the past few years, U.S. module price trends have largely been driven by antidumping and countervailing duties on Chinese suppliers. But recently the main driver has shifted; current module price trends are largely a result of supply-demand imbalance, with prices continuing to slump. During Q1, the quarterly average delivered price for Chinese producers ranged from $0.35/W for order volumes greater than 10 MW to $0.40/W for order volumes of less than 1 MW on the high side. After a record-breaking 2016, the near term will see relatively constrained growth compared to what we’ve seen previously in both the utility and distributed generation sectors. DG continues to face an everchanging policy and customer acquisition landscape, while the utility sector will seek to reset as it builds out the ITC pipeline and restarts the origination process. Altogether, the overall U.S. solar market is expected to drop 16% on an annual basis as utility PV projects decline relative to the massive utility PV pipeline build-out witnessed in 2016. In 2017, the residential and non-residential PV markets are both expected to experience year-over-year growth, though not without their own respective challenges. 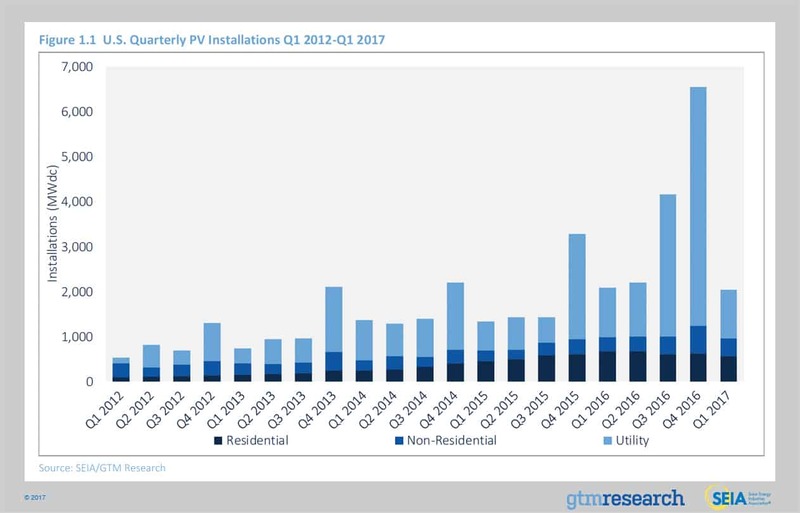 The near-term national outlook for residential PV is marked by a competitive landscape that is increasingly feeling the effects of national installers trimming back operations to focus on profitability, while non-residential PV contends with a challenging regulatory landscape. Despite build-out falling on an annual basis, the utility PV segment is still expected to see over 8 GWdc in 2017 – nearly double what was installed in 2015 – as ITC spillover drives significant utility PV deployment. 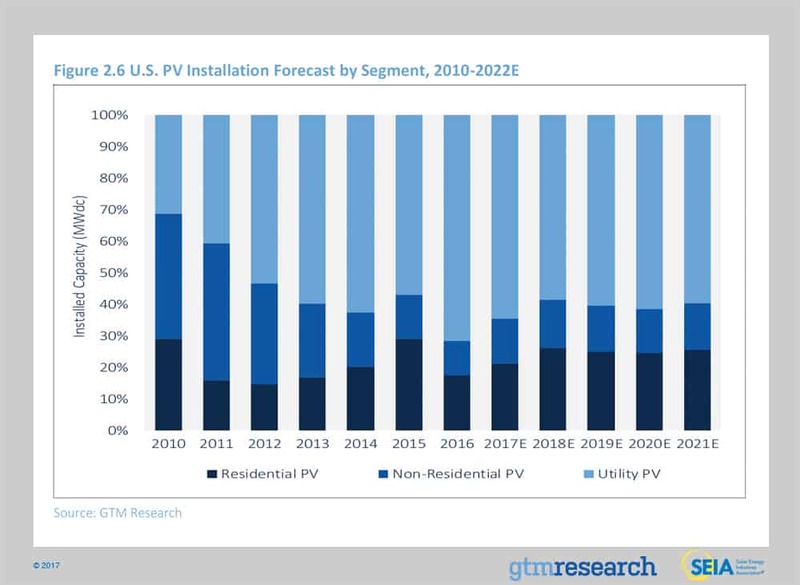 In 2018, residential PV continues to grow at a limited pace as major market installers seek to find more efficient means of customer acquisition and large national players reorient sales strategies, while emerging state markets begin to contribute a growing share of the residential market. However, 2018 marks the year in which the non-residential market will begin to feel the effects of regulatory and policy constraints that will lead to an annual decline in non-residential deployment. Though 2018 will stand as a relatively low installation year for utility PV, project origination will benefit the post-2019 outlook as procurement mechanisms outside of renewable portfolio standards drive an increasing majority of the market. By 2019, U.S. solar is expected to resume year-over-year growth across all market segments. And by 2022, 28 states in the U.S. will be 100+ MWdc annual solar markets, with 25 of those states being home to more than 1 GWdc of operating solar PV. However, downside risk looms over the long-term outlook for U.S. solar, due to a new trade dispute initiated by the domestic-based module and cell manufacturer Suniva. As mentioned, Suniva’s requests include, but are not limited to, a minimum price on crystalline silicon PV modules (initially $0.78/W) and a tariff on cells (initially $0.40/W). While it remains unclear how the International Trade Commission will ultimately rule on this petition by Suniva, the approval of the petition as initially filed would result in substantial downside revisions to our forecast across all three segments. A $0.78/W price on modules would match 2012-levels for imported Chinese modules and put system costs at 2015 levels. With a decision expected as early as H2 2017, GTM Research will continue to monitor the outcome of this petition and its ultimate impact on solar deployment by state and segment. Forecast details by state (40 states plus Washington, D.C.) and market segment through 2022 are available in the full report. Media inquiries should be directed to Mike Munsell at GTM Research and Alexandra Hobson at SEIA. GTM Research and SEIA have changed the naming convention for the U.S. Solar Market Insight report series. Starting with the report released in June 2016 onward, the report title will reference the quarter in which the report is released, as opposed to the most recent quarter in which installation figures are tracked. The exception will be our “Year in Review” publication, which covers the preceding year’s installation volumes despite being released during the first quarter of the current year.